Just a Little Venting! – Journey of Emotions! Exclusive of, not partaking in or allowing an exhale of grief to cross lips during said “doing,” equals “without” and is mutually exclusive with non-existence. Three “all or nothing” directives offer no wiggle room, “what if” scenarios or “but I was just” excuses. Why does He have to be so stringent and uptight? What’s a little whine before dinner done to harm anyone? Venting our annoyances is therapeutic, right? Guilty! I justify my “arguing” in ways that could turn a jury’s vote. But God’s word lacks an addendum that rights my wrongful attitude of grumbling. All has been resolved since this first text began an elevated discussion on complaining where I threw this verse in his face while, myself, complaining that he isn’t more sensitive. Crud! It’s so annoying when God convicts me while I’m convicting my children. Oops, did it again. 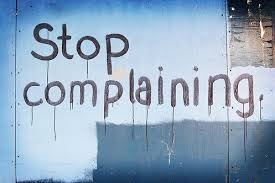 Truth…complaining ALWAYS takes our eyes off of opportunities God may be placing before us to serve and encounter others. Blinded by our own selfish desires for comfort, whether it’s a mountain or a mole hill, we will stunt our growth in Christ if we focus on the annoyances or grievances of a task or obstacle that blocks our path. . We become stumbling blocks with the contagion that is complaining by breathing negativity rather than the joyful spirit of Christ. God cannot be glorified in the midst of whine and pessimism. Only if we reflect His nature in EVERYTHING we do will true joy be found in all circumstances. In the past few months I have seen this come to fruition… The Lord has defiantly put his favor on me hete of late and when I get frustrated and pessimistic I have to remind myself of all the joy I have in the favor the Lord has given me and not the negative and when looking at the positive and being positive more joy and more positive have seemed to happen good produced good and bad produces bad as it seems ….. very well spoken and said awesome advice!!!! !